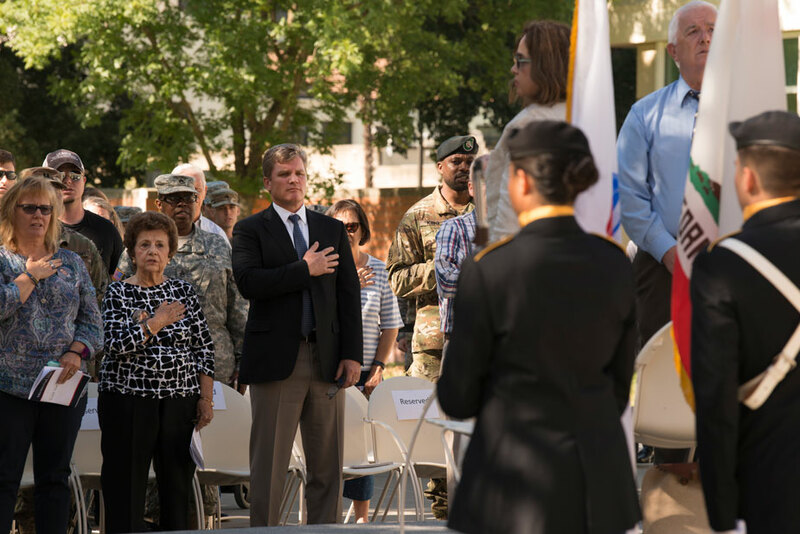 UC Davis’ early Memorial Day observance last Thursday (May 25) started with a crowd of about 200 people on the Memorial Union’s North Courtyard and ended inside the MU with people crowding around the campus’s new memorial wall honoring fallen Aggies. Gold Star Families are in the front row, reciting the Pledge of Allegiance. Pictured, from left: Cathy Conrad ’85, classmate of Gold Star Aggie Lt. Col. Mark D. Taylor (Army surgeon) ’86; Roberta Taylor, the Gold Star Aggie’s mother; and Brian Bohlig, son of Gold Star Aggie 1st Lt. James R. Bohlig (Marine Corps fighter pilot) ’66. The ceremony included remarks by Adela de la Torre, vice chancellor, Students Affairs and Campus Diversity; and Phil Knox, retired staff, who as the campus’s veterans program coordinator in the mid- to late 1970s, added UC Davis’ Vietnam War casualties to the Golden Memory Book — which has a biographical page for each fallen Aggie dating back to World War I.
Brian Bohlig talks about the father he never really knew, having been 5 months old when his dad, Marine Corps 1st Lt. James R. Bohlig, went to Vietnam in 1969. Student veterans read the names of the 135 known Aggie casualties. Army ROTC color guard leads the way into the Memorial Union, for the conclusion of the Memorial Day Ceremony. The MU, dedicated in 1955, is a memorial to Aggies who died in military service. Student plays taps outside the MU — and the notes envelop the crowd at the Gold Star Aggies Wall. Army ROTC cadets crowd around the Golden Memory Book at the Gold Star Aggies Wall. The page on the left is James R. Bohlig’s. 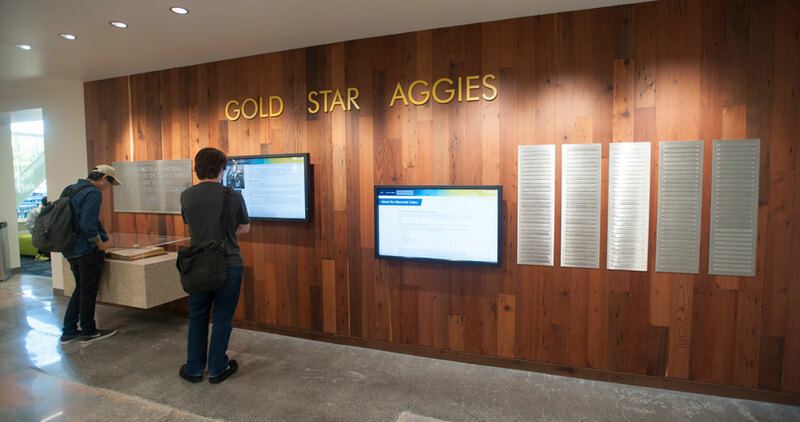 The Gold Star Aggies Wall: Visitors will find fallen Aggies’ names listed on the right, and touch-screen monitors for the viewing of pages from the Golden Memory Book.